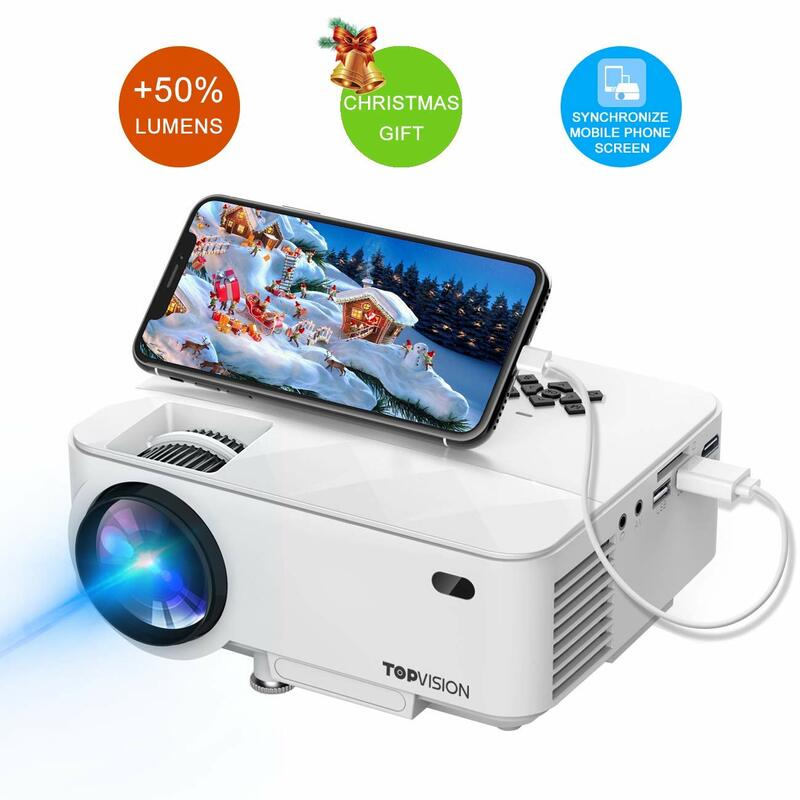 The TopVision projector comes with more 50-percent brightness, up to 176 inches display size, 1080p support resolution and many other advanced features. The phone projector can greatly synchronize Smartphone screens. 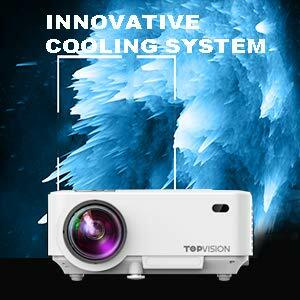 T TOPVISION 1080P Projector has impressive image adjustability. You have to follow two steps to manage the quality of image. Firstly, you have to adjust the ±15 keystone correction and secondly via adjusting the focus ring. The lens of this advanced projector is totally different from the resin lens. Because it comes with a tempered glass lens that gives impressive thermal stability. 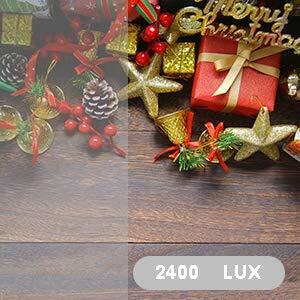 Consequently, the lens is able to fight with temperature excellently. 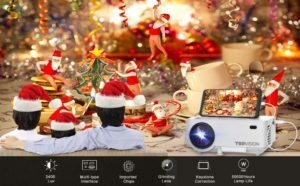 Amazingly, the 1080p projector by T Topvision works with smartphone screen. Also, the mini projector is compatible with laptops, smartphones and many other devices. You can establish a secure connect with your preferred devices using the available inputs such as USB, HDMI and Wi-Fi as well. If you are looking for impressive brightness from your projector then you don’t need to worry. This Topvision projector comes with 2400-lux brightness to provide more brightness than you expected. Apart from the impressive brightness, the T Topvision projector comes with 50,000 hours of lamp life that will last, I think more than thirty years. Also, a 24-month of warranty is attached with this upgraded video projector so you can claim replacement or refund if you don’t get satisfied with the projector. Who doesn’t want high quality entertainment at home? And this mini projector is here to give you the full entertainment at home. It comes with 2000:1 contrast ratio, 16:10 aspect ratio for the impressive entertainment at home. The supported projection size is from 50 inches to 176 inches from 1.5 meters to 5.2 meters. 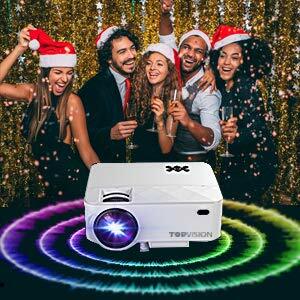 You can also give this projector to your friends and loved one because it can be a good Christmas gift as well. The Topvision projector gives you the best home cinema experience because it has 2400 lux brightness, imported chips, multiple interfaces, grinding lens, keystone correction and 50,000 hours of lamp life. It comes with a USB cable that you can use to connect your iPhone or iPad with the projector. You have to put the USB cable to the Out 5V port of this mini projector. The mirror display is not only supported with iPhone, but supported with Android phones too. 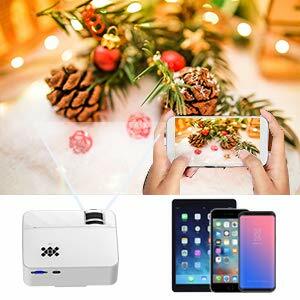 For the Android phone connection, you have to download EZCast App and then you will be able to connect your smartphone to this projector. The mini projector has 2400-lux brightness that means it is brighter than other normal portable projectors. 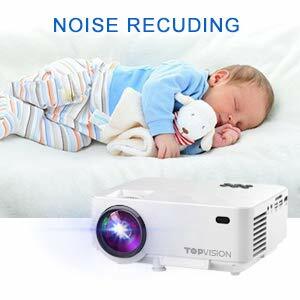 Also, it fully entertains you at home because it is a full high definition video projector. 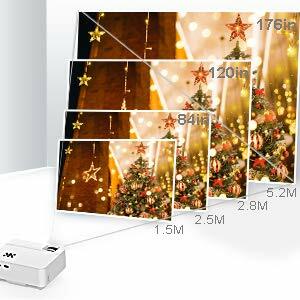 From 1.5 to 5.2 meters projection distance, you get 50 inches to 176 inches screen size. However, the suggested watching distance should be 3 meters. Now it is the time to enjoy high quality home cinema. The built-in hi-fi speakers provide impressive sound without any doubts. The performance oriented speaker offers you full-spectrum sound even at outdoors. The high quality sound can be perfect for parties, watching movies with family and football nights. An efficient heat management can be expected from the innovative cooling system of this portable projector. The Topvision projector is less noisy than other comparable LED projectors because it has a powerful noise-suppression capability. 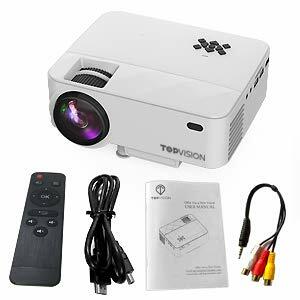 A Topvision projector, remote control, 3-in-1 AV cable, HDMI cable and user manual. The 2400lux projector doesn’t’ come with a battery so you have to plug it to an outlet. This is a phone projector so it greatly works with iPhone, Android phones, iPad via the USB cable. Also, the image can be adjusted in two steps by adjusting keystone correction and focusing ring. Please make sure that it doesn’t support Dolby sound so there will be no sound when you play Dolby sound videos.